Kakanin business marries tradition with entrepreneurship. Also known as rice cakes, kakanin has been part of the Filipino culture since ancient times when it was offered as food for the gods. The word kakanin was derived from the root word “kanin” which means either “prepared rice” or “to eat.” Rice, specifically the sticky variety or malagkit, is the primary component of the kakanin. Also Read: Why do Filipinos love to eat rice? 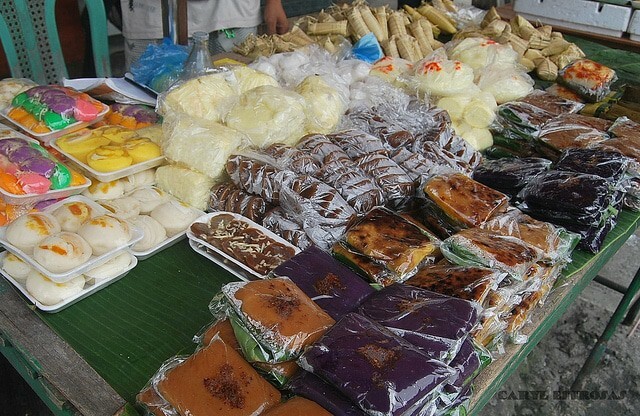 For other provinces where rice has less supply, root crops like purple yam or taro are also turned into delicious kakanin desserts. Filipinos’ love for kakanin goes beyond simple gastronomic pleasure. It is said that its stickiness helps attract luck that’s why it’s served during fiestas and other special occasions. If you want a business with ready buyers and products deeply rooted in Philippine culture, the kakanin business is definitely worth a try. People with hands-on knowledge and experience in making kakanin like sapin-sapin, biko, puto, and kutsinta. Those who have a passion for traditional Filipino desserts and way of cooking. Full-time employees or stay-at-home moms looking for a side business. Capital: Starts at Php 5,000 or less. Requires low start-up cost since the ingredients are cheap and easy to find in the market. It’s the ideal business you can start even with small quantities, allowing you to experiment with the product and test if there’s a demand in the market. Unless you’re getting a franchise, starting a kakanin business gives you the freedom to choose which types of kakanin to produce, how much to sell, and to whom. You can start this business virtually anywhere and regardless if you’re a full-time employee or unemployed. Business location is flexible in the beginning. If you’re starting with small quantities to test the market, a door-to-door or made-to-order selling will help you find your first few loyal customers and grow from there. Huge potential for growth. Since there’s a wide variety of kakanin business ideas you can tap into, the possibility of expanding your product offering after initial success is always waiting in the corner. Kakanin business takes a lot of time and effort to operate. Preparation and cooking alone will consume most of your energy, especially during the Christmas season when the demand usually spikes. With limited capital, you will be required to handle most of the business operation alone at the beginning, hence the need for passion and commitment. The market is a bit saturated in some areas. Without enough data from a feasibility study, you might have a hard time recovering your initial investment sooner. How to start a kakanin business in the Philippines. Step 1: Educate yourself about the kakanin business by attending seminars and training. DTI and other private institutions offer training and seminars yearly. Ideal for those who want to venture into the kakanin business but have no experience making rice cakes, these seminars usually teach participants hands-on experience in cooking the kakanin and insights on how to price the products and get reliable suppliers. This may not be applicable if the kakanin business is already part of your family’s heritage, with the techniques and hands-on training provided by your own relatives. Step 2: Offer something unique to the market. Kakanin business is ubiquitous in the country. It’s impossible to visit any town or city without stumbling on a kakanin business. While the presence of competition means there’s a huge demand for the product, it also requires newcomers to come up with unique ideas to penetrate the saturated market. Start by specializing in one kind of kakanin and offer the best product in this category. For example, Rosalie’s in Marilao, Bulacan started with bibingka, making it different from other competitors by adding leche flan on top of it. From there, the store expanded and added other types of kakanin in its inventory. Alternatively, you can focus on a native delicacy unique to your town or province. Susie’s Cuisine of Pampanga, for example, found success in selling “tibok-tibok,” a delectable Kapampangan pudding made with carabao’s milk. Step 3: Test your kakanin business idea by offering samples. Tasting your own kakanin may involve some kind of bias. The only way to test whether your product is ready for launching is to have it pass the discriminating tastes of people immediately around you. You can sell your kakanin or offer free samples to your officemates, close friends, and relatives. Get their feedback and use the constructive criticisms you’ve earned to improve the product. Step 4: Register your kakanin business. To make your business legitimate and to protect your exclusive right to use your business name, register it to the Department of Trade and Industry (DTI) and in the Bureau of Trade Regulation and Consumer Protection (BTRCP). You also need to get Barangay Clearance and get a permit from the Local Government Unit and the Bureau of Food and Drugs. Step 5: Write a kakanin business plan. A business is a blueprint that gives your kakanin business a sense of direction. It will help you determine whether you’re achieving your goals and vision. Without something to target, your kakanin business will easily lose its identity and direction. Even without an MBA, you can create your own business plan. After all, you’re dealing with a small business for now. It’s a living document subject to changes over time. Executive summary which provides an overview of the business, its products, competition, and target market. Marketing plan featuring the strategies to reach out to the target market. Production plan with details of the processes involved in making the product/s. A financial plan which lists down the gross profit, expenses, and net profit of the kakanin business, giving the owner a compass on how to maximize his income. Step 6: Find a reliable supplier. A kakanin business needs regular fresh ingredients for its daily production. Find a trustworthy supplier and forge a long-term business relationship with it. By doing so, you will be able to avail of discounts and be assured that your business operation will run smoothly. Step 7: Invest in a good packaging design. People buy with their eyes. No matter how great the taste of your product, people will still think twice about buying it if it comes with a terrible box. A good packaging design is an effective marketing tool. It shows the business owner’s professionalism, creativity, and dedication to provide the best product possible. The box must be as visually appealing as the product inside, with vivid hues like red, yellow, or pink to evoke happiness and excitement. Step 8: Find a good location. The location also matters to a kakanin business especially if you’re offering it through a stall. Put it up in crowded places like inside the mall or near the terminal, school, or office. If you’re just starting out, you can participate in food bazaars to introduce your products to as many people as possible. Start small. Focus on a single type of kakanin and constantly improve its taste, presentation, and uniqueness to earn loyal customers. From there, you can reinvest your income to expand your product line and offer other types of kakanin. Participate in seminars or training that not only teach you how to cook the kakanin but also techniques that can extend its shelf life. Spend your income wisely. Every single centavo must be tracked to ensure nothing is spent on useless expenses. Reinvest whatever you earn back to your business. Be innovative. Never stop improving your product to stay above your competition. Whether it’s a new technique to prolong the shelf life of your kakanin or marketing strategies that will put your business in front of many people, grab every opportunity to keep your competitive edge.